It was a quiet weekend on the drug policy front, except for the Million Marijuana Marches in cities around the world, and all the news was marijuana-related. Colorado Parolees and Probationers Can Now Use Medical Marijuana . Gov. John Hickenlooper (D) Friday signed into law a bill allowing medical marijuana by people under criminal justice system supervision. Now, such people will not be charged with parole or probation violations for using it. Ohio Politicians Look to Undercut Legalization Initiatives . Faced with as many as three looming marijuana legalization initiatives, some Buckeye State legislators are seeking to take the air out of the movement by pushing more incremental reforms, such as a CBD cannabis oil bill or a legislatively initiated medical marijuana ballot issue. But it remains unclear that even if such a measure should pass, it would reduce the pressure for full-blown legalization. Washington State Had $25 Million in Recreational Marijuana Last Month . Recreational pot sales were $24.8 million in April, nearly double the January figure of $12.7 million and a dozen times higher than the $2 million in July 2014, the first month of legal marijuana sales. So far this year, pot sales have totaled $119.7 million, with $29.9 in projected retail excise tax revenues. Montana Appeals Judge's Ruling Blocking Parts of Restrictive Medical Marijuana Law . The attorney general's office last Wednesday appealed rulings by District Judge James Reynolds that blocked provisions of the law prohibiting advertising and the commercial sale of medical marijuana, as well as provisions limiting caregivers to three patients and subjecting doctors who recommend medical marijuana to extra scrutiny. Those provisions have never taken effect because of Reynolds' rulings. 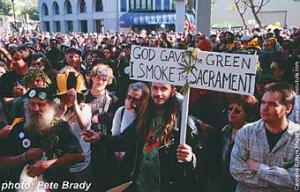 Marijuana Legalization Actions Take Place Around the World . Thousands showed up in Rome, thousands more in Prague. Also, Paris and Berlin, and various Brazilian cities, among others. Victoria, BC, to Regulate Pot Shops Like Vancouver . British Columbia's capital and second largest city is set to follow Vancouver down the path toward regulating -- instead of prohibiting -- marijuana shops. Local police are not opposed, the move could better control who enters the shops, and provisions can be made for nonprofit collectives that have operated for years, city officials said.